Raw fish and seafood purchased from Chinatowns in Brooklyn, Manhattan, and Queens have been the source of a rare skin infection called "M. marinus," that leads to red swollen bumps, Health Department officials said. 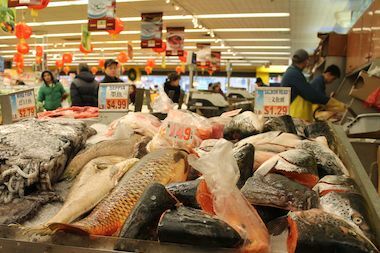 NEW YORK CITY — An outbreak of a rare skin infection has been linked to contact with raw fish and seafood purchased in one of the city's many Chinatown markets, the city's Health Department warned. So far, 30 people who bought and handled live or raw seafood from Chinatown markets in Lower Manhattan, Flushing, Queens and Sunset Park, Brooklyn in the past six months have been infected with the rare skin infection "M. marinum," the Health Department said Wednesday. The bacteria causes painful red swelling and bumps beneath the skin and can lead to serious infection requiring surgery if not treated, health officials said. Other symptoms include red, tender swelling under the skin, hand or arm pain, and difficulty moving fingers. The infection is easily treatable with antibiotics, officials said. Since the bacteria enters the skin through open cuts, the DOH encouraged all people who purchase or prepare food bought from the markets to wear waterproof gloves. "All cases have come from markets that sell live or raw fish or seafood ... We are still investigating to see if it’s the markets that are at risk or if it’s specific fish or seafood," officials from the Health Department said on Wednesday. They urged anyone who believes they may have been exposed to see a doctor. “If you show any symptoms or believe you are at risk, please see a dermatologist or infectious disease physician and explain that you think you may have a skin infection (M. marinum),” the Health Department said in a statement. The food is safe to be eaten, officials said, and the bacteria is not contagious between humans.